SELAH — David Edwin Swier, 79, passed away Sunday, July 29, 2001 at his home in Selah. David was born December 29, 1921 in Spokane, WA to Omar and Gertrude Gearhart. His given name was Edwin Guy Gearhart. 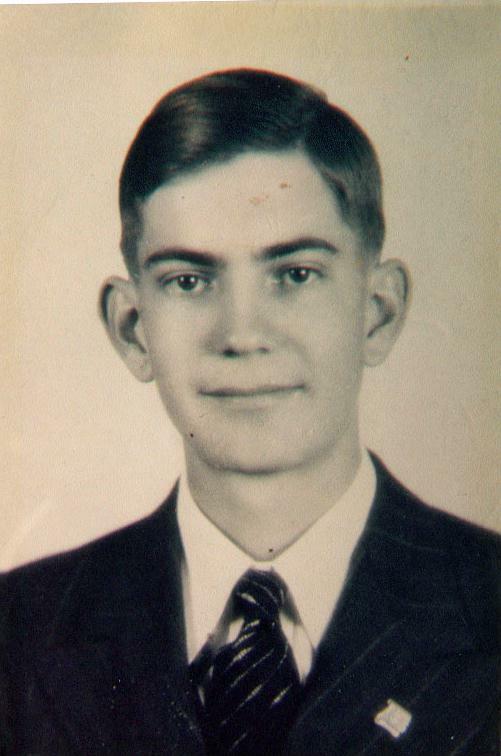 He was adopted by Walter and Laura Swier in 1930 and changed his name to David Edwin Swier. David attended grade school and high school in Cowiche, WA. He enlisted in the U.S. Army during WWII and served as an aircraft and engine mechanic. He married Anita J. Brownell on September 20, 1957. They shared many joys together over the next 44 years. David worked for his parents in the orchard business, and later worked for Michelson Packaging Co. before retiring. He enjoyed gardening, fixing up cars, and he particularly enjoyed spending time with his grandchildren. 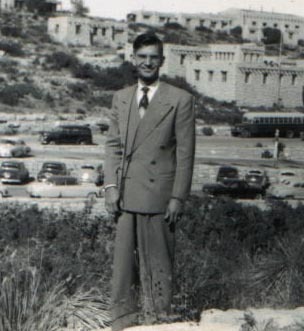 He is survived by his wife Anita Swier of Selah, WA; four sons, David E. Swier of Ohio, Randy Swier of Kennewick, WA, Thomas Swier and his wife Patti of Georgia, Richard Swier and his wife Ellen of Toppenish, WA; and his daughter Debbie Swier of Kent, WA; 11 grandchildren; 3 great-grandchildren; 8 sisters, Eva Heier, Margie Water, Jessie Riddle, Betty Ann Bailey, Ruth Anderson, Carol Babb, Dorcas Tobin and Helen Marie West; and a brother, Frank Walker. He was preceded in death by his parents and adoptive parents; 3 sisters, Mary Smith, Ruth Kyker and Alice McReynolds; and 3 brothers, Junior Gearhart, John Gearhart, and Donald Cannon. A memorial service will be held on Thursday, August 2, 2001 at 3:00 p.m. at Keith and Keith Funeral Home, 902 W. Yakima Ave. In lieu of flowers, contributions may be made to the donor’s favorite charity. This obituary was most illuminating in my quest to find out more about my father’s family. I had never met nor corresponded with my grandfather. I had corresponded with my step-grandmother, Anita Brownell Swier, over the years, but my grandfather seem to be this silent, enigmatic figure who handed down his adopted name to me, but little else. Who was he? Conspicuously absent from the obituary was a mention of my grandmother, who was my grandfather’s first wife. She and my grandfather divorced when my father was quite young. 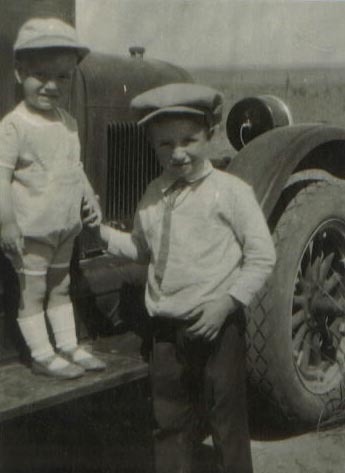 My father dislikes talking about his childhood; consequently, I knew little about his family. I did know, as I mentioned previously, that my grandfather had been adopted. I did not know the names of his natural parents. My natural great-grandmother remarried some time after her children were adopted by other families, and my father knew her as Grandma Lightle. This was all the information we had, and we did not realize that Lightle had not been my grandfather’s birth name. Once I read the obituary, I posted some queries at online genealogy sites, and I was contacted by a cousin — her father, too, had been one of the Gearhart children. She told me the following story. My great-grandfather, Omar Alfred Gearhart, suffered a gunshot wound to the head in a hunting accident. As a result of this brain injury, he drank a lot and could also become violently angry. 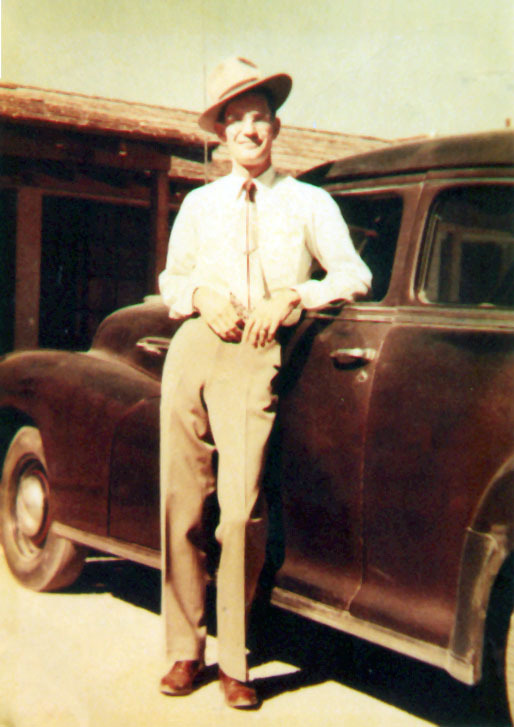 During the Great Depression, he opened up an auto repair garage with a partner. Shortly before his youngest child was born, he argued with his partner and was later found shot dead in the garage. The money and the partner were both gone. After her husband’s murder, Gertrude was left with 10 children and was pregnant with another. She had no means of income. Her pregnancy hindered her ability to work. She had the baby — a boy — and still couldn’t find work. The older children would find work here and there, but it wasn’t enough to fill the needs of the family. They were all starving. Bessie, the third from the youngest, said that she remembered standing at her mother’s bedroom door waiting for her turn to nurse. Gertrude was trying to to nurse the three youngest children just to keep them alive. Gertrude knew the situation couldn’t continue. She had heard the State of Washington was going to come and take her children away. She didn’t want them parceled out to distant homes, losing contact with each other. She wanted them to be able to stay in contact with each other. She went to her pastor and asked for help. They came up with a plan to ask the congregation for help. When the congregation was presented with the situation, members of the church stepped forward to adopt the children. 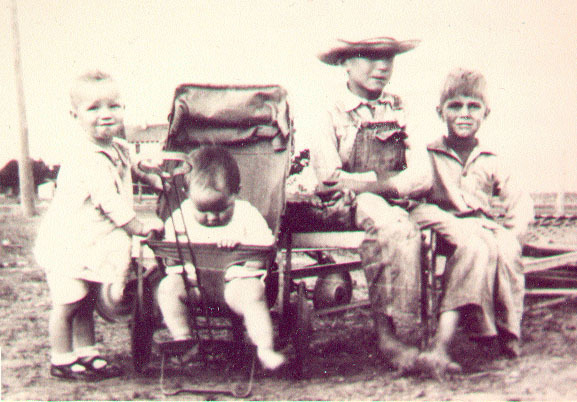 The adoption papers included Gertrude’s request that the children grow up knowing each other. The only children who weren’t adopted were those who were old enough to be on their own and the baby. My grandfather was adopted by Walter Swier and Laura Helen Schmidt Swier. My father remembers them very fondly. His cousin Rick Zeutenhorst has told me he remembers going to their home in Cowiche for large family gatherings. His grandmother, Laura, used to hold him and croon softly to him in Dutch when he was upset. On the night his mother left, she held him like this all night. She was tragically killed in a car accident when my father was about 13. I honor both lineages in my family tree. Some people might say that since the Swiers were not my “blood” relatives that I shouldn’t include them in my genealogy. I disagree. If not for their willingness to help a poor family in need, I might not be here, as my grandfather may have died of starvation or else lived such a different life so as to be unable to meet and marry my grandmother and father five children. The Swiers provided my father with stability and rare moments of happiness in a difficult childhood, and I honor them for that. I would like to learn more about the circumstances of my great-grandfather’s murder and the death of my great-grandmother. Through a Soundex-based search, I was able to discover the correct spelling of “Lightle” for her name and the month and year of her death — March, 1971. One of my research goals is to try to find desdendants of the other Gearhart children mentioned in this obituary and let them know their story, should they be interested. If you believe you may descend from Omar Alfred Gearhart and Gertrude Nettie Perkins, I would love to hear from you. Are you interested in learning about genealogy? There are lots of sites on the Internet that point the way. Genealogy@About.com is very comprehensive; it is designed to be a one-stop portal, like other About.com sites. USGenWeb is good if you’ve already started and need more information. rssGenealogy.com has an abundance of links, but if you’re a beginner it might be a bit overwhelming. Cyndi’s List is a great site and well worth a visit. I became interested in genealogy when a photocopy of a descendant tree prepared for a family reunion was passed on to me by my grandparents. In fact, it was almost exactly like this one, but because it was prepared for a Cunningham family reunion, it included more desdendants. One of these days, I need to get more of my cousins on my own tree so they can use the information I’ve found to further their research. That was about 15 years ago. I think that’s the first time I had given thought to the fact that I was part of an extended family that stretched back into history. I wanted to know more about these people from whom I descend. I wanted to know their names, where they lived, what they did. So, I became an amateur genealogist. At first, I didn’t know what I was doing, and I didn’t really know where to go for help. This was before the Internet, and I wasn’t really sure where to start. I found Tracing Your Ancestry Logbook at a bookstore. I was a student at University of Georgia, which has a great microfilm collection. I started with the desdendant chart I had. Once I had found those individuals on census records, I was stuck. What did I do next? Fill out Family Group Sheets as completely as I knew. Send photocopies of my Family Group Sheets to individuals in my family who might be able to correct and add to them. Interview as many older members of my family as I could. Sadly, some of them have passed away since I started compiling family records — I will not have the chance to ask them about their families again. Take down all the information I can about individuals with the surname in which I am interested. I have had to make multiple trips to the library to take down information I could have compiled the first time I went if I had only been more thorough. I would make copies of all records I find and keep them in a binder. This includes information from books, historical records, online pedigrees or other genealogical reports. I would be more persistent about getting information from relatives. When relatives haven’t responded, I have most often let the matter drop. I should have made more of a pest of myself. I would plan my research trips. Sometimes, I went to the library on the spur of the moment, and I was not prepared for researching. I would be more judicious about what information from others’ research to include. I would make copies of anything that pertained to my family, but I would not create records or Family Group Sheets unless my information was based on solid sources. One of the things I eventually did do right is get a software program. The first one I bought was Broderbund’s Family TreeMaker. It is a pretty good program. Essentially, it allows the user to create family group sheets and in turn, develop all types of reports. It also allows the user to create scrapbooks with image files. Admittedly, I did not have the 2005 version, which looks sleeker than the version I had, but I felt FTM was limited in that other types files could not be uploaded into scrapbooks. I also felt that the “notes” section was limited. However, it was easy to navigate. I have recently purchased Family Tree Legends by Pearl Street Software. I am really happy with it. It seems to have all the same features as FTM, but uploading files to the Internet is easier, and many different types of files may be uploaded into scrapbooks. I also like the different options available for reports. I think the reports look nicer than those in FTM. It was also less expensive. It also has real time Internet backup. If you have ever lost a ton of data because your computer crashed, then you will grow to love this feature. You need Adobe Acrobat Reader in order to view pdf files. Happy researching! My grandfather will turn 80 today. That deserves a mention in the family history blog, I think! 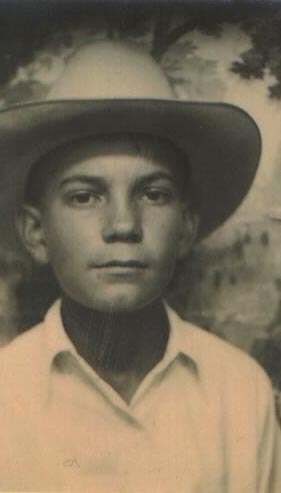 My grandfather was born Oliver Udell Cunningham on May 3, 1925 in Tulia, Swisher County, Texas to Herman Cunningham and Annie Lola Jennings Cunningham. His parents called him Udell from birth, I believe, and so later he legally changed his name to Udell Oliver Cunningham. 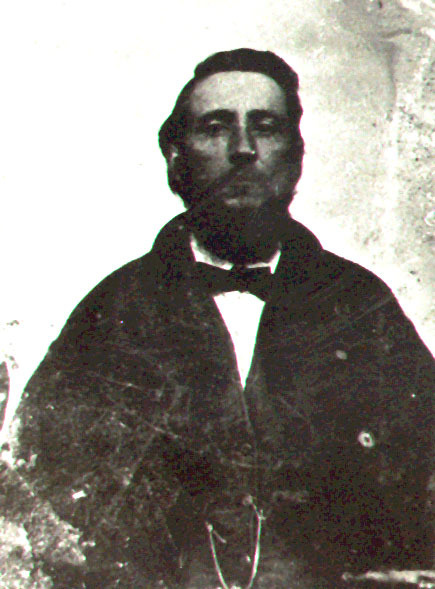 The name Udell was suggested by Aunt Jenny, the second wife of Udell’s grandfather, Veto Curry Jennings (you can read a letter about John B. Jennings and view a photograph of him or you can view a photograph of his wife, Lucinda Fannie Curry). Aunt Jenny found the name in a book she had enjoyed, That Printer of Udell’s by Harold Bell Wright. My grandfather played trombone in the high school band. At some point, possibly while he worked in the post office, he began collecting stamps. My grandfather has had a life-long interest in trains. He also likes big band swing. Animals and children see right through his gruff demeanor and love him on sight. My grandfather first married Orlie K. Quisenberry and had with her a son, Michael Udell Cunningham, who has since changed his name to Michael Lee McElhaney. On October 27, 1951, my grandfather married my grandmother, Doris LaNell Thurman in Clovis, New Mexico. Together they had three children: Patti Jo Cunningham (my mother), Teddy Wayne Cunningham, and Terri Udell Cunningham. My grandfather served in the Sea-Bees in the Navy during World War II. Later, he would join the U.S. Air Force and retire in the late 1970s with the rank of Master Sergeant. While in the Air Force, he worked principally as a photographer and told me he wrote a textbook on photography, which was uncredited because he was a serviceman. He still enjoys photography. While in the Air Force, the family lived in various locales, principally in Enid, OK., Aurora, CO., Nancy, France, and Kaiserslautern, Germany. My grandparents retired in Aurora, CO. In his retirement, my grandfather likes to garden and usually plants flowers in several places all over his yard. I recall the yearly trips to Dardano’s Flowerland (which seemed to last for ages!) during which my grandparents would select flowers for their gardens. My grandfather has six grandchildren: Dana Michelle Swier (me) and Lara Christine Swier, both children of Patti and Thomas Swier; Martin Priester Cunningham, child of Wayne and Helga Priester Cunningham; and Matthew Wayne Findley, Rebecca Lee Findley, and Amy Johanna LaNell Findley, children of Terri and Michael Findley. As of this writing, my grandfather has ten great-grandchildren: Sarah Noelle Cooke, Margaret Elaine Huff, and Dylan Thomas Huff (my children by both my former husband Wayne Cooke, and my husband Steven Huff); Shane Mann, a step-son of my cousin Martin, and Alexander Markus Cunningham, Martin’s son with wife Becky; James Michael Valentine, Anna Grace Valentine, and William Andrew Valentine, my cousin Rebecca’s children with her husband James Valentine; Harley Hardin and Keith Ashley Hardin, my cousin Amy’s children with her husband Keith Hardin. My sister is expecting her first child in June, which will bring the total to eleven! 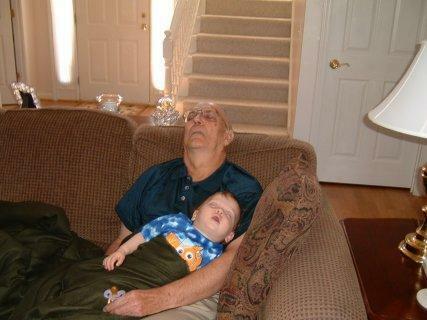 My grandfather clearly loves being a grandfather and great-grandfather. He would do surprising things with me when I was younger, like watch MTV videos — he made political commentary about Ronald Reagan when a clip of the then-president appeared in Ratt’s “Round and Round” video! He once threw a tomato worm at me. He chased me around the yard with a dead fish from his tropical fish tank, too. He used to make homemade ice cream and manned the grill (he makes the best steaks!). My grandmother is a seamstress and he always cuts out her patterns and installs the hardware for snaps on her creations. When I was very young, he smoked a pipe. He told me he quit because people only gave him pipes for Christmas. I don’t think there is anything my grandfather wouldn’t do or give for his loved ones. I spent many weekends with my grandparents when I was a child, and they looked after me after school until my mom left off work. He’s been a permanent fixture in my life, and we are very close. He has always shown an interest in the things I learn about our family history as I do my research, and he is always happy to share stories to add to my family history collection. He took pictures of us all and chronicled our past. I am honored to chronicle his. 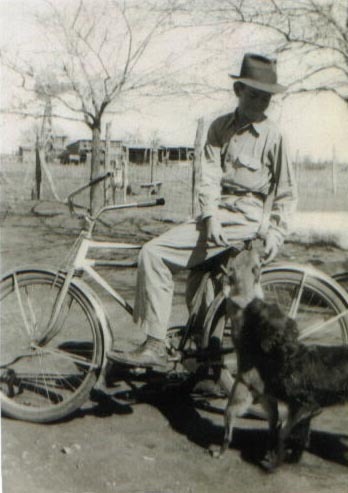 There was a Dr. Shaw who was quit[e] an elderly man who moved to Tulia in late 1920’s or early 1930’s. My Dad told me that this man had known my grand[d]ad “John Jennings” when he was a young man. Dr. Shaw told me that he and grand[d]ad had been very close friends. He said that he had visited in the home of John Jennings many times before he or my grand[d]ad either were married. I asked him about John[‘s] death and he told me that they were having a meeting where anyone who had a favorite political friend that they wanted to speak for was welcome political rally. He said that John went and made a speech for the candidate he was interested in. But it did not suit the opponent who was there. As John was walking home this fellow waylaid him and was going to give him a whipping because of the things he had said in his speech. Dr. Shaw said instead of giving John a whipping he had to take one. Dr. Shaw said John was a Blacksmith and was a strong and active young man. It seems as if he went on home. The next morning the man went into a hotel just across the street from John’s shop and asked if they had a gun and told them there was a mad dog out in the street. Someone got a gun for him and he walked over to the door and shot across the street killing John. I asked how the trial turned out. Dr. Shaw said he didn’t suppose they had a trial. He said that the country was so badly torn up just after the Civil War that anyone could get by with any crime if they could get out of the country without getting caught. If you have been researching your family history, you may have run into the classic pitfall. Primary sources can be expensive to obtain and difficult to find. Logic tells us that getting hold of eyewitness accounts when possible is best, but that might involve costly trips and sending away for copies of records and archives that can quickly put a dent in your budget. In some cases, primary sources are not saved or their whereabouts are unknown. Secondary sources are generally more available, but might not always be reliable. It should be noted that primary sources may not always be correct. Eyewitnesses do not always describe things accurately (or without bias). Spelling errors are common. For example, on my great-great-great-grandmother’s headstone, her name is incorrectly inscribed as “Mary Anna Cunningham.” In fact, her given name was Mary Anne Penelope Anthony — she married Johnson Franklin Cunningham. Her family may not have realized this fine distinction and so misspelled her middle name. In a related error, Mary Anthony’s name was incorrectly transcribed by another genealogist (a common error, as handwriting can be difficult to read) as “May A.F. Anthony” in her marriage record. Also, my grandfather’s family Bible has the name of his grandfather, Johnson Franklin Cunningham, incorrectly transcribed as “Johns Cunningham.” While he may have gone by the nickname “Johns,” not realizing his full name was “Johnson” may have thrown roadblocks in my way. Secondary sources are often good, but must be carefully weighed. When I first started working with genealogy online, I was amazed at the plethora of evidence available. I was transported into paroxysms of delight when I found the LDS site and began clicking through those Ancestry Pedigrees. A word of caution: sometimes genealogists do not take care to be thorough in their research. I have found countless errors on that site. For example, the site lists mythological Norse gods as the forebears of early English royalty. No doubt those were really taken from a book, but common sense would tell us a chronicler referring to his king as a descendant of the gods is not to be taken seriously. Yet, someone had that in his or her family record or it wouldn’t be in that pedigree file! Also, the site routinely has genealogist errors in name spellings, dates, places, and the like. You just can’t trust other genealogists to be thorough and accurate with their research. The best thing you can do if you run across a claim you believe to be dubious is research it yourself. Don’t include information you believe to be erroneous in files you share with others. That just perpetuates the cycle of misinformation. For example, I was told several years ago by a librarian that many people with the surname “Bolling” descend from Pocahontas. This is, indeed, true. I have ancestry in the Bowling/Bolling family through my great-great-grandmother, Stella Bowling. 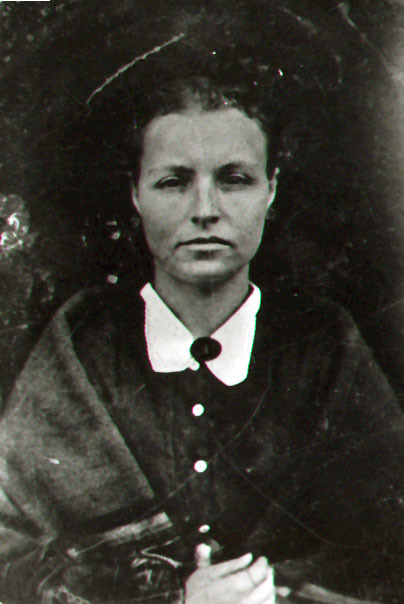 I have tentatively traced her lineage back to the pioneer, Benjamin Bolling. I found another genealogist’s family records tracing Benjamin Bolling to Pocahontas herself. I was, needless to say, excited by the prospect of being descended from a mythical figure such as Pocahontas. However, upon further research, I discovered that Benjamin Bolling is one of the infamous “blue Bollings,” so called because they appeared “out of the blue” in a family history by Zelma Wells Price in the 1960s. This erroneous information has been copied over many times by lazy genealogists. In fact, the dubious lineage was reproduced on his historical marker! DNA testing on descendants of Benjamin Bolling as compared with other Bollings descendants with a proven relation to Pocahontas have proven that he was not a descendant of Pocahontas. Take any information you find in secondary sources like other researchers’ files (including mine) as a lead for research and not conclusive proof. On the other hand, information reproduced in several secondary sources can be as reliable as (or even more reliable than) primary sources. Nowadays, with the advent of sites like US GenWeb, whose aim is to provide free research help to genealogists, we can access more primary sources online. This is great news for those of us who can’t afford to break the bank on research trips and copies of vital records. Update: Correspondence with Bowling cousins who have taken DNA tests has proven conclusively that Stella Ophelia Bowling does not descend from Benjamin Bolling, as other evidence previously led me to believe. As I said in this article — be careful about sources! 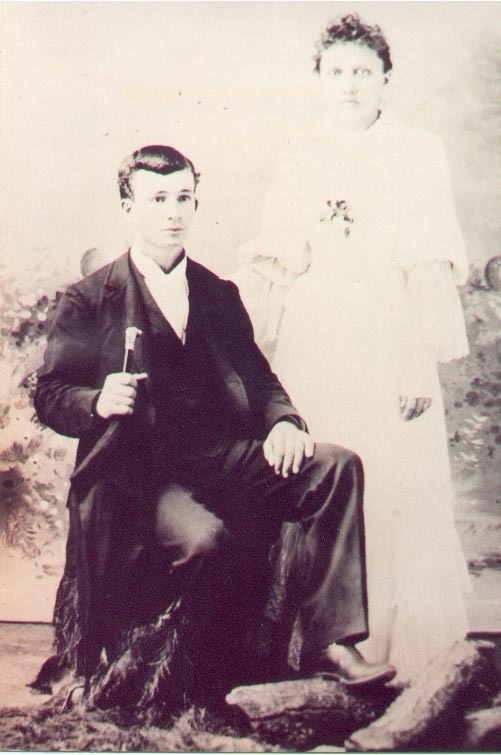 The following portrait was taken of my great-great-grandparents Stella Ophelia Bowling and Amos Blakey Cunningham on May 30, 1894, their wedding day, in Collin County, Texas. Stella Bowling was the daughter of William J. Bowling and Mary Elizabeth Kennedy and Amos Cunningham was the son of Johnson Franklin Cunningham and Mary Anne Penelope Anthony. It is with pleasure I answer your most welcome letter. I am glad you are interested in school and hope you enjoy your school days as much as I did mine. Really I think our school days are our happiest days with all their troubles and trials — yes I had my share of “trouble & trial” in school even tho I never got a whipping. When I went to school the schools were not “Graded” as they are now. We had classes — sometimes 2 or 3 of a kind, I mean of the second reader we’ll say as some pupils would have McGuffey’s Readers while others would have another kind. I used the McGuffey’s Readers. The “Old Blue-Backed Spelling Book” (Webster Spelling Book) and Alvin I don’t believe I’d be afraid to “spell” with my Grandchildren to-day. I was eight years old April 13, 1875 and started to school some time that year, at Lewisville, Denton Co., Texas. However my Mother had taught me at home, so I was in the second reader and could spell “way over in the book” and knew how to make the figures and count. That first school house was up on a “rise” N.W. from town about 1/2 Mi. It was a large “two story” house; the upper room was used by the Mason Lodge the lower for school church and Sunday School. Sometimes there were 75 or so pupils so had to have two teachers, but both taught in that one big room. We sat on long benches and a class would go up to the teacher to recite and sit on a long bench, only the spelling classes would stand in a row and “turn down”, when one missed a word. The pupil who was head of class to day would “go foot” tomorrow. The house was heated by a stove and they burned wood. When it was real cold the teacher would let us go sit awhile by the stove to warm our feet. They wouldn’t let us draw pictures in time of books. In 1879 we moved way out to Wise Co. I was 12 by then, you see so had other books to study such as Geography — Monteith’s Third Part. Rag’s Third Part Arithmetic and Grammar — Smith’s, I believe, was the first one I used; then later Reed & Kellogg’s. So we had to parse and diagram. Yes that was hard. That school house was a real country school about 3 or 4 Mi. S.W. of Bridgeport (the old town) Texas, in Pleasant Valley. It was built of logs (I believe) and had long home-made benches. No black-boards, so we used slates. There was a plank “desk” on each side to write on, the boys used one, the girls used the other. Yes, we had a time to write, some had bought copy books, others used “fools cap” paper and the teacher would set a “copy”. It too had a stove and burned wood. The house was in the woods so we had lots of shade to play in. The boys played on one side of the house, the girls on the other. The boys at both these schools played ball and other similar things. The girls would play games such as base “Learner Lou” etc — we had nothing to play with but always had fun. Girls all wore sun bonnets — never went bare headed but in warm weather would go bare-footed, same as the boys — oh! the big girls didn’t, of course. Sometimes school would be only for three months, and a five month school was a long time — I mean in the country. Then sometimes there would be a subscription school in Summer. Sometimes the teacher would “stay a round” with the people — not have to pay board. My first school I had to walk alone and go about three Mi. but at this last one we lived just little over 1/2 Mi. from the school house. While we lived there tho there were two years I did not go to that school, because the teacher did not keep good order. I went to a lady who taught in her house 2 Mi. away. There we sat by a fireplace and used her chairs. She was such a fine teacher too — could explain things so we could understand even arithmetic. Also she had some different readers I used but I forget the names. Of course, they were the higher books 5th & 6th. My letter is getting too long to tell about when I “went off” to school. So will close for this time and if you want the other part I’ll write again.